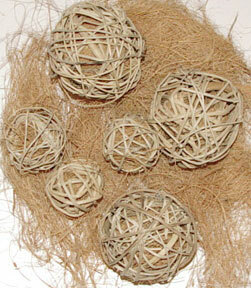 Another variation of our very popular Munch Ball foot toy! The inside of this natural reed ball is filled with sterilized coconut fiber which your parrots will love to shred and munch! 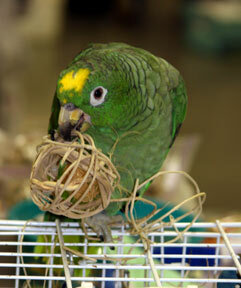 These are sure to become a favorite in your house as evidenced by the young Mealy Amazon who was happy to give a demonstration on demolishing a coco munch ball at the Arizona Society of Aviculture Bird Mart in Tucson! 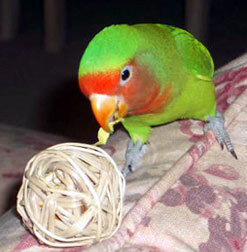 Kimo, peachface/fisher lovebird hybrid, is having a great time pulling the stuffing right out of his small munch ball! 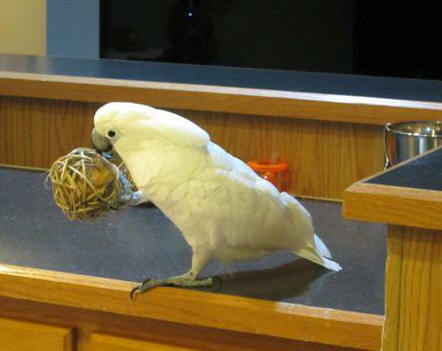 Stella, Umbrella cockatoo owned by Brenda, is enjoying her large Cocomunch ball! Check out the fiesta munch ball too!